It's Muffin Tin Monday again! 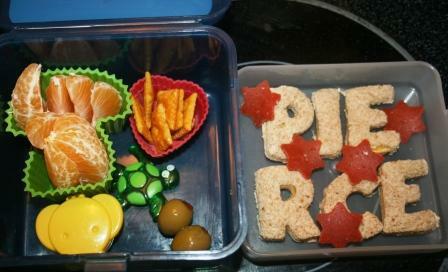 I have a little bento I did for Pierce to share today. Clementine orange slices in a mushroom tin, Cheeze-Its in a heart tin, an elephant with a few chocolate chips for dessert, a turtle pick with green olives, and a cheese sandwich spelling Pierce with pepperoni stars. I think he liked this one - it came back without leftovers! For more fun ideas of lunches for kids, check out Muffin Tin Mom. I bet he loved seeing his name in food. I hope you had a wonderful Christmas! That looks fun..and yummy of course! funny - I thought the sandwich was rice crispy treats. That would be a fun lunch! Your meal is adorable. Love the way you spelled out Pierce's name. Have a blessed new years! So cute and creative, as usual, Lisa. Hoping your and yours had a nice Christmas day. Cute lunch Lisa! I can see why there weren't any leftovers. I really love the way you spelled out Pierce's name, too! Liv and I thought the "Pierce in the stars" was a cute idea! Great idea to spell his name! Very creative, Lisa. How cute, you must have alphabet cookie cutters, that is a good idea!! I can't wait to see and read all about your Christmas!!!! I hope you are sorting the pictures for posting! Did you take any videos? Oh this is just adorable and looks delicious also!! I can see why there wasn't any leftovers! Just fabulous, as usual Lisa! Oh my gosh... what a ditz I am. I seen the work Pie and wondered what RCE Stood for. Now I get it Pierce. That is really cute Lisa. these always look fun : ) and yummy too! Wow...my poor kids missed out...they got a sandwich, chips and an apple, all in a paper bag LOL. How cute! I bet he loved seeing his name in food. What a great idea. I found you at Muffin Tin Monday. Love your blog! I love the cheese sandwich spelling out his name! That is cute! A nice variety of foods too! I would love it tooooo!